Can silver wound dressings be used with all patients and what is the typical result? Silver wound dressings can be used to with virtually any type of wound including burns, surgical procedures, ulcers, lesions and draining wounds of any type. Often, silver wound dressings are used for chronic types of wounds such as venous ulcers, chronic diabetic skin ulcers or pressure ulcers. Studies have found that silver wound dressings speed up healing to various degrees in each of these particular types of uses. They are also much more effective in limiting the risk of infections in chronic wounds were ongoing wound care is a concern. For home health care providers that may not see a patient daily this is a definite consideration for these chronic types of wounds. Can a patient have a reaction to a silver wound dressing and is it counterindicated with any combinations of medications? Silver wound dressings are not problematic when used with other medications since the antibacterial action will not interfere with any other antibiotic or other types of medications the patient may be using. There are some concerns that silver, especially in topical applications, may interfere with the action of some debriding agents by limiting the enzyme activity of these compounds. Occasionally there are patients that will have an allergic reaction to the silver in a silver wound dressing, but this is rare. Typically these are individuals that have another type of metal allergy and it can often be determine by an examination of the skin around any jewelry on the patient or by asking the patient or a family member. Can some silver wound dressings be reused at any time and for any reason? Different silver wound dressings may be used on exudating wounds more than once, depending on the specific type of dressing and the protocol used for treatment of the wound. Since the silver is embedded in the dressing and not a surface or topical application in these dressings, reuse with the same level of effectiveness is possible. To reuse the dressing on a draining wound simply remove the dressing and rinse with clean water or a saline solution. 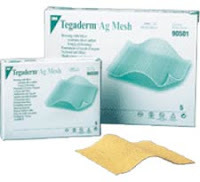 The dressing does not need to dry before reapplication but removing the excess water is necessary to allow the dressing to make contact with the surface of the wound and remain in place with the adhesive used. What is the proper way to remove silver wound dressings? Generally most silver wound dressings used in hospitals, emergency rooms, clinical settings and for home health care use will be used with other types of cover that holds in moisture. Removing the outer cover dressing is the first step and then simply remove the silver wound dressing as long as it is moist and supple. If the silver wound dressing is dry or seems to be adhering to the wound wet with saline solution and allow to sit to absorb moisture and rehydrate. When this happens the dressing can be easily removed.